you have too few user-experience researchers or designers. you want your team to collaborate better—the Lean UX way—instead of coding the feature without designing it. you need Agile developers to stop coding, to join you in Design Up Front for iteration zero. you want your team to understand the product that they’ll be building. you want your team to embrace iteration and welcome feedback about usability and user experience—including from early customer validation. you want lower development costs. you want to solve user problems rather than develop a technically “cool” feature or solution. you want your team to quickly deliver light designs over heavy wireframes, composites, or specifications. Skip to the table of contents if you’re looking for a specific Five Sketches™ method topic. It’s human nature. When people have only one idea—one design—they hold onto it tightly and they start to build it. Then, when that one idea shows a weakness, they bolt on another idea to fix it. This is how inelegant solutions get built. On the other hand, when people have lots of ideas, they’re less likely to hang onto any particular one of them. When people practice generating many ideas, they soon realize that generating ideas is cheap. Coding and testing is much more expensive than spending a few hours thinking and sketching on paper. Generating lots of ideas makes it easier to combine and evolve the best parts into a quality software design. The best way we’ve found to generate lots of ideas is to involve multiple people, and to work quickly. Practice has taught us that two participants is too few and five is too many. The target of three to four participants is mainly about time, because each additional person generates at least eight sketches that need to be presented and critiqued. No sketching skills or artistic abilities are required. You can choose participants from your Development, Product, and QA teams, and even from Marketing. Success tip. Try to include the developers who will build the software. Each participant must be present for the entire process—and it takes hours of interruption-free commitment. Intermittent participation fails because some participants will have information that others have missed. For this reason, managers can make poor participants—they’re often pulled away. Managers, however, play an important role in prioritizing and making people available, so your participants can commit to the entire process. As facilitator, you yourself must not sketch, because the group tends to defer to the facilitator’s ideas. But you won’t be bored. You’ll be busy guiding the process. The Five Sketches™ process was developed through trial and error. We collectively worked through the friction and the frustration, and we didn’t give up—because we had a real problem to solve. With insufficient UX resources, it was essential for us to find a way to compensate. After each attempt at a workable process, our participants were debriefed separately and all their concerns were channelled back to the group. Together we found ways to improve the process so it works. And not only does it generate quality designs, we discovered it also has team-building benefits. Every part of Five Sketches™ described below has a purpose. So before you try adjusting the process to suit your team, we recommend you closely follow the ten steps below, at least once. Success tip. Learn from our mistakes. Try the recommended process as is, before you adapt it. You’ll need up to 55 minutes. Inform the team, in the first 20 minutes. Review the user personas, the market requirements, and the competitors’ products. Invite a subject-matter expert to spend 5 to 10 minutes on industry concepts and jargon. Invite the product manager to say five sentences about the company’s business goals and product strategy. Decide how the team will get any additional information that’s needed. Discuss and set the problem statement, in the second 15 minutes. Typically, this is a common task that users need to accomplish. Once you have a problem statement, check that it is a single problem that describes the user’s goal without describing a solution. If you’ve never done this, read about getting the problem statement just right. Agree on what a sketch is, in the third 15 minutes, if the group has never sketched. Make sure you’ve brought sketching supplies, and then teach the team how to communicate effectively with sketches to help people succeed. Book a four-hour design session, in the remaining few minutes. Four hours seems a lot, but it’s often barely enough. Collectively you’ll be presenting dozens of sketches, producing a dozen more, assessing and critiquing their merits, and then responding to the critique. Many participants have observed that the best solutions come in the last hour, when people have tired of analyzing and instead let their brains generate ideas more freely—using the first three hours of idea sharing as subconscious input. And remember: a few hours of sketching is cheaper—and easier—than coding, testing, and then discovering that you must discard your work because you built the wrong thing. Success tip. You’ll be tempted to schedule shorter sessions—to save a half hour or even an hour—but give yourselves the full four hours to succeed. If you have multiple problem statements, schedule one four-hour session for each problem statement, plus one extra session that you can release if it’s not needed. Space the sessions one day apart, whenever you can. Schedule ahead, because it’s impossible to book a 4-hour session on short notice. Always book one more four-hour session than you think you’ll need. If you don’t need a session, it’s easy to release it with one day’s notice. In contrast, it’s impossible to add a four-hour session with one day’s notice. Never schedule a session that every participant can’t attend. Ask each user to sketch five substantially different ideas. If it’s their first time, five will seem like a lot. The team hasn’t yet learned that there are always at least five ideas in response to each problem statement. Why five? The success of this method depends on filling the space with ideas, so they can be mashed up and iterated. It also enables participants to let go of their ideas, since they learn that they can have more ideas, if needed. Early on, before we shortened it to Five Sketches™, we named the process Five Sketches Or Else We Fail, to drive that point home. If you’re having doubts, read Why five sketches? Why not three? Success tip. It’s rare to generate five sketches in one sitting. Knowing that the inspiration for your five ideas will come erratically, over a 24 hour period, plan your homework accordingly. Five Sketches™ teams succeed best when a manager tells the participants: “If you think you can’t get all five sketches done, come and see me before they’re due and I’ll help you reprioritize your work.” Early on, our Development Manager had to repeat this message to different teams of sketchers. The facilitator has homework, too: buying supplies, such as extra markers and Blu-tack adhesive putty. Different brands of adhesive putty have different colours: green, blue, white. The colour is unimportant. You also need quality snacks and drinks, which you make available for specific activities. Quality snacks include cheese and crackers, nuts, and sliced fruit or dried fruit. Offices often lack serving bowls and a cheese board, so plan ahead. Before each session, remove excess chairs from the room, so five people can easily walk around in it. Ensure the room’s central table is big enough for four people to sketch on. During the four-hour session, shares their sketches. Before the sharing begins, ask everyone to add descriptive titles to their sketches and to label the actions in red, if needed. Those details are often missing. Also, to promote creativity, ask everyone to remove from the room devices that will interrupt them. Success tip. If a participant didn’t bring five sketches, ask them to step out and finish sketching right then, while everyone else waits. If they can’t produce their five sketches quickly, postpone the session—do not shorten the four-hour session to accommodate people without their homework, because the group needs the full four hours for other activities. Experience tells us this: if you accept fewer sketches from one person, at the next session more people will bring fewer sketches. Limit the questions. If participants are genuinely confused about a sketch, let them ask for clarification. But always interrupt when participants start questioning details (“Is it A or is it B?”) and ask them to accept both A and B, because at this stage the goal is to identify many ideas without favouring any idea. Present each sketch, and then use adhesive putty to post it on the wall—without attempting to group it with others. Post it. 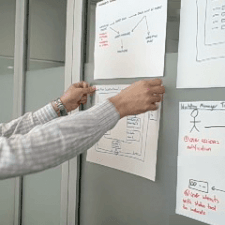 After presenting it, post it on the same wall as the other ideas—but don’t try to group the sketches. 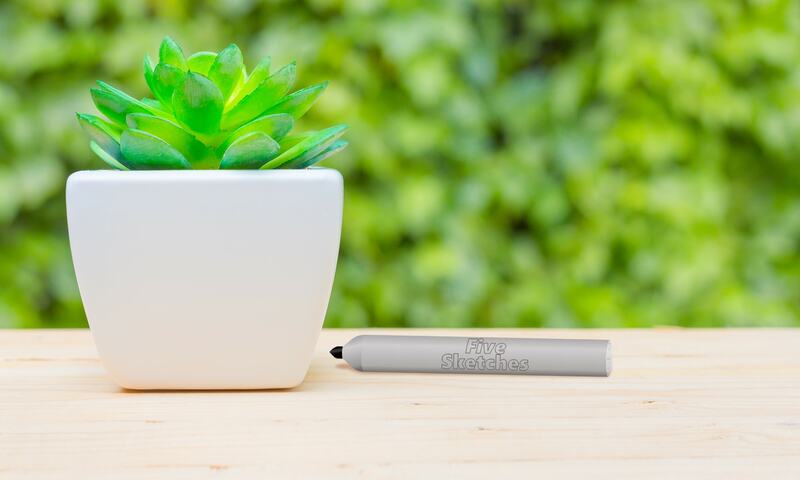 To post the sketches, use an adhesive putty such as Blu-Tack. Don’t use tape, because tape interferes with the photocopier’s feeder in step 8. To acknowledge that it takes courage to stand and present an idea. To remind themselves not to analyse or critique the idea. Success tip. Participants will want to engage with many of the sketches, but this isn’t the time for it. Tell them: “If you react strongly to someone’s sketch, quietly write a quick note to yourself about it—so you know your thought will be retained—and then mentally let go of it. Focus on the next presenter’s sketch.” The time to engage these thoughts is later, in step 5. 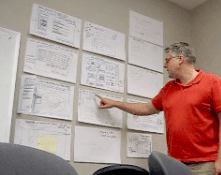 Once all sketches are presented, ask: “Who saw good ideas on the wall that weren’t your own?” This helps the group see that there are more than the five ideas they brought. And they’re about to have even more ideas. As sketching begins, set out good quality snacks. You want to reward the participants for sketching, and feed their brains. This might seem petty, but it promotes cooperation and increases participation. Have each participant point out the borrowed detail and the new detail. Post this round of sketches on a different wall. Remember to have everyone say: “Thank you for that idea,” for the same reasons as before. Repeatedly point out that each idea has been enhanced by combining details from different people’s sketches. Also point out that the group is still identifying new ideas—beyond each person’s the original five sketches. Mash-up sketches don’t just generate more ideas. They also diffuse ownership of the design that the team will eventually choose, by ensuring that some of everyone’s ideas have been incorporated. Mash-ups reinforce collaboration. Iterating and combining their ideas makes the team more receptive to changes in response to project sponsors, stakeholders, QA staff, usability testers, Beta testers, and regular users. Up until now, it’s been all about generating ideas without critiquing them. After the mash-ups are presented, the team finally gets permission to start analysing, but in a constrained way. During the analysis phase, keep it impersonal. Nobody should feel attacked for their ideas. To do this, as facilitator, constrain the group to one piece of feedback about every sketch before returning to provide a second piece of feedback about every sketch, and a third, and so on, until there’s no more to say. Write the comment on a sticky note and post it near or on the sketch. Move your hand to the next sketch, and ask for one statement that begins with the structured phrase: “This idea may succeed because….” Repeat these steps until there are no more positive comments. Sometimes the same feedback applies to almost every sketch. If so, add the same sticky note to each sketch. Write the comment on a yellow sticky and post it near or on the sketch. Move your hand to the next sketch and repeat these steps until there are no more critical comments. Occasionally, you’ll see that the may-not-succeed round of comments was ego-bruising for some participants. If so, do a third round, asking: “This idea may succeed because….” This allows people to point out additional benefits of their sketches—without it becoming a debate. Success tip. Never blend the positive and the critical comments into one round. Every sketch must be seen to get equal amounts of criticism and praise. This process lets people analyse and judge the sketches while keeping it relatively impersonal. Next, it’s time to respond to the analysis. Ask the participants to “sketch a pretty good solution”—anything from any wall, and any new ideas that they feel are needed. Ask participants to resolve the may-not-succeed details and retain the may-succeed details. As before, provide good quality snacks while people sketch. Success tip. Although you’ve asked for a “pretty good solution,” this round of sketches will likely surpass that standard. However, setting the bar at perfection is an idea blocker—so don’t stifle the process by asking for excellence. Instead, give the participants room to over-deliver. As before, participants take turns presenting their sketch. Each person will have only one sketch to present, this time. Post these sketches on a wall that’s separate from all other sketches. These sketches are your outcome. At this stage, as facilitator, you’ll see one of these. Outcome One. Most likely everyone has sketched the same idea, or parts of the same idea that fit together. Point out how they fit together, and then capture the common understanding, as described below. Outcome Two. There are two competing ideas. There are two ways to move forward. If you think it would break the impasse, do another round of mash-up sketching—and strongly encourage the team to borrow something from the competing idea and to add something new. If the two ideas won’t budge, try to “measure” which idea is better. Do this before you continue with step 8. Outcome Three. You realize that there’s a dependency on another piece that needs to be designed. No problem! Tackle the dependent piece in parallel by completing its step 1 immediately, and then continuing the dependent piece with steps 2 through 8 the next day, using the session that you already booked. Meanwhile, move all the current sketches to a side wall to make room for the dependent piece. After that is resolved, you can turn back to the side wall, and watch the pieces fall into place rapidly. We’ve seen cases where there were three (!) consecutive dependencies, but once the last dependency was designed, all the earlier solutions fell into place in under an hour. Success tip. An Outcome Three is a good result. Once you remove the blocking problem, it can quickly become an Outcome One. Outcome Four. The problem statement was wrong, too vague, or too large in scope. No problem! No code was written, so the cost of discovering that you were trying to solve the wrong problem is minimal. Start again at step 1, to define the right problem statement, and then send everyone away to sketch five ideas for the next session—which you have already booked. Move all the current sketches to a side wall—and keep them on the wall as potential ideas to borrow from later. At the end of the four-hour session, appoint one person to write numbered steps—like instructions—that an outsider could use to walk through the successful idea. Insert the scanned images of the results of Outcome One or Outcome Two in this written sketch. Crop the images to show only the detail relevant to each numbered step. Microsoft Word does this well. As facilitator, don’t do this work yourself; let the participants own the production of this written sketch. Do review and edit the written sketch before the next session. Success tip. To scan the images, first carefully remove the adhesive putty. 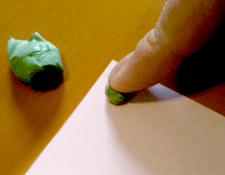 If you have trouble removing the putty, use one lump to press and remove another lump from the paper. Most photocopier-scanners can email you the images or can save scanned images on a USB memory stick that you insert in the copier. If you have multiple problem statements, at the start of the next four-hour session, take 15 minutes to review the preceding session’s written sketch. You’re looking for clarification, additional details, and new information. This exercise is not about producing a document, but about generating understanding and agreement. And with so many ideas floating around, it’s likely participants will have forgotten some details when they start to implement the design. If revisions are needed, assign this work to a participant. When this is done, you can show it to your project sponsor, described in step 9. For tax purposes, scan and save all the day’s sketches—not just the “Outcome One” sketches. In some jurisdictions, the dozens of additional “unused” sketches may be evidence of research and design, if tax auditors require evidence. That’s because a direct path to success is not considered research, whereas trying different ideas as a form of risk-taking—by documenting your “failures” in the form of abandoned sketches—may help demonstrate that R&D took place. Walk the project sponsor through the sketches from Outcome One or Outcome Two. (Don’t share the written sketch—it’s got too much detail. If need be, hand the sponsor paper and pens, and have them sketch any additional requirements. After they leave, adapt the design to incorporate the new requirements into the written sketch from step 8. 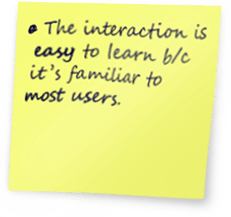 Share the written sketch with your usability analysts. They’ll need it when they quickly validate the design with users, for example by testing paper prototypes. The written sketch can also be a starting point for technical specifications. Keep doing … the things that worked. What was essential? Stop doing … the things that didn’t work. What could you do without? What was a hindrance? Start doing … the things that were missing. What got skipped? Discuss the combined Keep-Stop-Start lists. 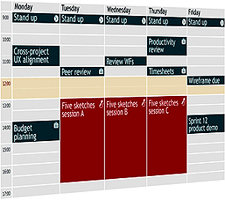 Share the recommendations with the team and with others who are considering the Five Sketches™ method for producing quality software designs, quickly. Guess what? Five Sketches™ isn’t the only method that’s been developed to solve software-design problems. Have a look at the Design Studio method, or read Bill Buxton’s book, Sketching User Experiences. You’ll notice that they share key elements: sketching, working quickly, generating many ideas before narrowing the focus to one idea. Different groups have come to the same conclusion: sketching works. That said, Five Sketches™ doesn’t benefit every project. Sometimes a problem needs a cookie-cutter solution—one that everyone can already see, or one that complies with a standard. Produces quality designs, quickly. By considering many ideas and sketching their way through the choices, your team quickly develops good designs that are clearly understood and that can be built. Brings new skills. Involvement in design work improves the creativity “fitness” levels of non-designers, and can help change your corporate culture. Participants realize the benefit of generating ideas, and mashing up ideas—welcoming input from others rather than defending their one prize idea—to generate better designs, quickly. This also makes it easier, a bit later in the development cycle, to recognize the need for changes once your usability researchers start to discover user feedback. Engages employees. Involvement in design is a professional stretch that has a rewarding outcome. Participants make a valuable contribution to the product. Participants feel product ownership. And the collaboration contributes to team building. Saves time and money. Design reduces risk. technical and usability issues arise during the design and discussion stage, not after coding. And the solutions are more creative. Influences future designs. More team members will have background knowledge of previous design decisions. In large product suites, more team members will learn about other parts of the product. And you’ll get greater consistency. Want to try—but not by yourselves? At Five Sketches Consulting Inc we can provide design facilitation to help you learn and apply this method successfully. For more information, please email Jerome FiveSketches.com. Review a specific step: 1 | 2 | 3 | 4 | 5 | 6 | 7 | 8 | 9 | 10. Sketching to communicate effectively. This includes a ten-minute group exercise to learn how to communicate through sketches.